Navy to open Jeju base in Dec.
After years of public protests and ensuing delays, the Navy is poised to introduce a strategic naval base on Jejudo Island as early as December as part of the country’s efforts to beef up maritime defense, officials said Monday. A captain-led unit is scheduled to be launched on Dec. 1 to defend the base together with the Navy’s 7th Task Flotilla and part of the Submarine Force Command, which will move to the island from their current headquarters in Busan and Jinhae, South Gyeongsang Province, respectively, a Navy official said. When their relocation ends, the base located in the southern town of Gangjeong is expected to house more than 3,000 seamen and their families. With more than 91 percent of construction having been completed, a launch ceremony will take place in mid-December to early January, the official noted. “The stationed forces are tasked with guarding the port and nearby waters and maintaining facilities there,” the official said. Initiated in 2007, the project has repeatedly been postponed by vehement protests of activists and villagers who filed a lawsuit to foil the construction work on concerns over potential environmental degradation and militarization of the site famous for tourist attractions. The focal point was the proposed destruction of the “Gureombi” volcanic rock, which measures 1.2 kilometers in length and 150 meters in width and provides a habitat for endangered species such as striped shore crabs and narrow-mouthed toads. It kicked into high gear following the Supreme Court’s reversal of a lower court’s ruling that the job should be invalidated due to the absence of a prior environmental assessment. The top court, however, determined that the construction was legitimate because the Defense Ministry carried out the approval process again in 2010 after controversy broke out. The initiative is designed to set up a “military-civilian” compound on the island, 90 kilometers off the peninsula’s south coast, with piers and other facilities to dock a mobile fleet of up to 20 naval vessels and a number of 150,000-ton cruisers. The military has claimed that the installation is key to properly coping with contingencies in the southern sea area, securing the country’s maritime transportation routes and helping boost the regional economy. Military and local government officials have since stepped up efforts to soothe opponents’ jitters, holding various rounds of consultations and vowing to devise measures to minimize potential environmental damage. “The people consistently raise environmental concerns and we’re striving to take steps to appease them in cooperation with supervisory authorities,” the official noted, adding that the ongoing protest will not pose a major hurdle for the base’s takeoff. 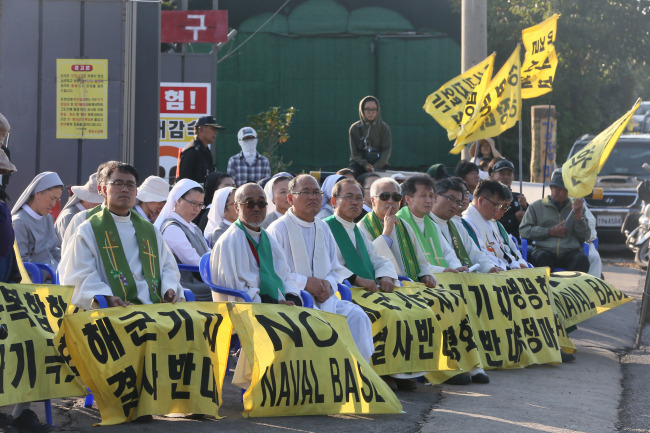 Though much of the public furor has died down, a mass organized by the Catholic Solidarity for the Realization of the Jeju, Peace Island, continues to take place every day at 11 a.m. in front of the entrance of the site in protest against the work. The association, established four years ago with more than 3,700 priests and ascetics from 15 Catholic groups, marked their anniversary on Oct. 12. Kang Eun-joo, an activist at the union, said the organization plans to carry on with their crusade even after the base opens, in partnership with other campaigners on the scene and those from St. Francis Peace Center in the village. “It may not be as fierce as our previous activities at the site and take different forms, but we will continue our work,” she told The Korea Herald.